I’ve never been an LCD Soundsystem fan. The albums were always too kitsch, a little try-hard and unashamedly referential to their far superior musical influences. Nevertheless, there is something alluring about the dance-punk project’s bandleader James Murphy. An inexplicable quality that makes him, and his brilliant record label DFA Records, so appealing and so important for independent music. 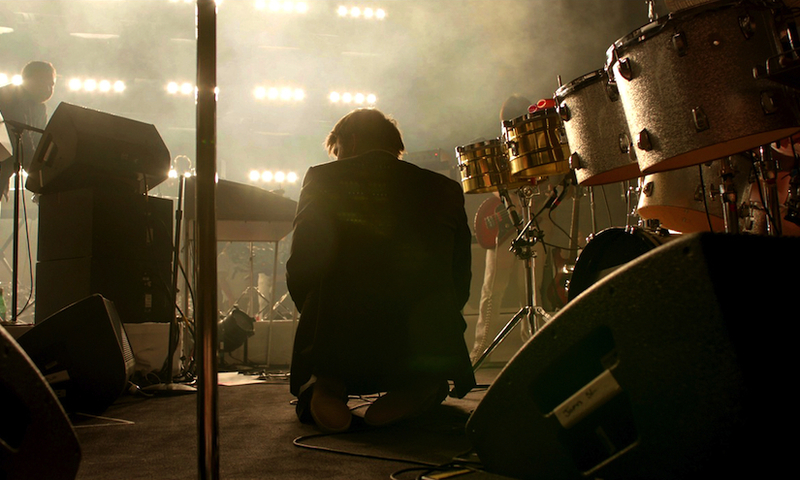 Shut Up and Play the Hits is a concert film documentary about LCD Soundsystem’s last ever live show. A legendary four hour performance at NYC’s Madison Square Garden, filmmakers Dylan Southern and Will Lovelace present the gig with a great vigour and enthusiasm, letting it play out for all it’s exuberant glory. Regardless of whether you’re an LCD Soundsystem fan or not, you’ll fully embrace the greatest hits moments such as a rawcous rendition of eight minute opus ‘Losing My Edge’ and ‘North American Scum’, this time with added Arcade Fire. The most interesting aspects of this music documentary is when the directing duo blend the frenzied live show with it’s eulogising aftermath. Through fly-on-the-wall style, Murphy wakes up the following day in his swanky apartment with a raging hangover, a sweat stained shirt and his dog licking his face. It is perhaps too bittersweet and solipsistic for most, only skimming the surface of a modern musical icon. Yet it impressively demystifies the enigmatic man behind the music; strolling through suburban New York, walking his dog and drinking coffee just like any other ageing hipster. By the time Shut Up and Play the Hits comes to a teary close, it’s portrayal of a 42-year old man giving up on the rockstar dream is reverent and austere. We aren’t privy to any substantial background information on the band’s demise, nor do we get any insight into Murphy’s future endeavours. Instead, Shut Up and Play the Hits gives us what 20,000 fans bought tickets for back in April, 2011: it shuts up and plays the hits. I’m listening. FYI 1 – I saw Shut Up and Play the Hits as part of documentary festival CPH:DOX‘s Music Programme Launch. The film was screened in a LOUD concert hall, followed by an incredible DJ Set from the Murphy man himself. It was a rather incredible night of entertainment, and yes, you should be jealous. FYI 2 – Being John Malkovich’s Spike Jonze was one of the twelve camera operators during the performance. As is this flick couldn’t be anymore twee, I bet Wes Anderson worked as costumer designer too (he didn’t). This entry was posted in ★★★★☆ (4) and tagged arcade fire, being john malkovich, concert film, concert movie, cph dox, danish film festival, Danmarks Radio, Death From Above, DFA, DFA Records, documentary, James Murphy, James Murphy documentary, LCD Soundsystem, lcd soundsystem movie, losing my edge, Madison Square Garden, north american scum, Shut Up and Play the Hits, Spike Jonze. Bookmark the permalink.